Muslims all around the world is celebrating Eid al-Fitr on July 17 & 18, 2015, after a month of fasting during the holy month of Ramadan. 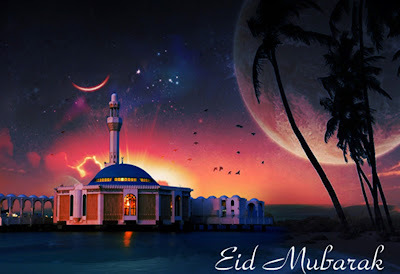 2015 Eid al Fitr is celebrating on Friday in Saudi Arabia, the United Arab Emirates, Qatar and several other Muslim nations, while Muslims in India will celebrate the festival, where it is referred to as Eid ul Fitr, on Saturday, depending on the moon-sighting. It is one of the most happiest momemnts of Muslim community. 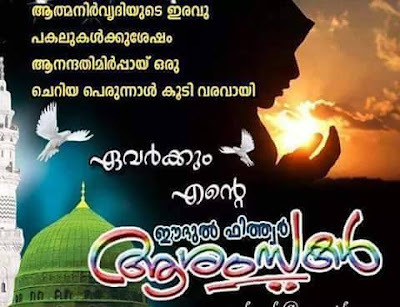 Eid, Eid al-Fitr, Eid ul-Fitr or Eid, عيد الفطر‎ ഈദുൽ ഫിത്വർ is a celebration which marks the end of Ramadan, a holy month of fasting observed by Muslims. Eid al-Fitr, also called Feast of Breaking the Fast, the Sugar Feast, Bayram, the Sweet Festival or Hari Raya Puasa and the Lesser After the last day of Ramadan, on the first day of Shawwal. 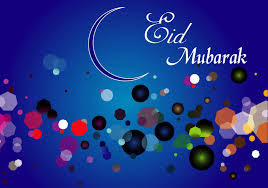 Eid Al Fitr is predicted to begin on Friday July 17 2015 in this year. വരാനിരിക്കുന്ന പതിനൊന്ന് മാസത്തെ വരവേല്‍ക്കാനുള്ള പരിശീലന മെന്നോണം വ്രതശുദ്ധിയുടേ ദിനരാത്രങ്ങള്‍ അസ്തമിക്കുകയായി. ഹിജ്റ വർഷം ശവ്വാൽ മാസത്തിലെ ആദ്യ ദിവസമുള്ള ലോക മുസ്ലീങ്ങളുടെ ആഘോഷമാണ് ഈദുൽ ഫിത്‌ർ അഥവാ ചെറിയ പെരുന്നാൾ. റമദാൻ വ്രതമനുഷ്ഠാനത്തിന്റെ പരിസമാപ്തികുറിച്ച് കൊണ്ടാണ് ഈദുൽ ഫിത്‌ർ ആഘോഷിക്കപ്പെടുന്നത്. ഈദുൽ ഫിത്വർ എന്നാൽ മലയാളിക്ക് ചെറിയ പെരുന്നാളാണ്. ഈദ് എന്ന അറബിക് പദത്തിന്‌ ആഘോഷം എന്നും ഫിത്‌ർ എന്ന പദത്തിന്‌ നോമ്പു തുറക്കൽ എന്നുമാണ്‌ അർത്ഥം. അതിനാൽ റമദാൻ മാസമുടനീളം ആചരിച്ച നോമ്പിന്റെ പൂർത്തികരണത്തിനൊടുവിലുള്ള നോമ്പുതുറ എന്നതാണ്‌ ഈദുൽ ഫിത്‌ർ എന്നത് പ്രതിനിധാനം ചെയ്യുന്നത്. ഈദിന്റെ (പെരുന്നാളിന്റെ) ആദ്യ ദിനം റമദാൻ കഴിഞ്ഞു വരുന്ന മാസമായ ശവ്വാൽ ഒന്നിനായിരിക്കും. വാനില്‍ ശവ്വാലമ്പിളി ദൃശ്യമായതോടെ മുസ്ലിംകള്‍ പെരുന്നാള്‍ ആഘോഷത്തിന്റെ തിരക്കിലാണ്. What Muslims do during Eid? It is customary for a Muslim to wake before sunrise and clean themselves and dress in smart clothes before going to offer the Fajr prayers. As fasting is forbidden during Eid, Muslims will have a light breakfast, often signified with dates. After this they attend special prayers called Salaat. It is also essential that Muslims donate to charity to help the poor and needy before the Eid prayers. This is called “Zakat”, and the amount which is given to charity is calculated based on one’s personal possessions. Muslims are required to walk to Eid prayers and forgive and forget any arguments that they may have had over the last year. EID Prayers The Eid Al Fitr prayers are called “Salat Al Eid” in Arabic. There is no audible call to prayer for the Eid prayers. Muslims will gather in a mosque or open space en masse and offer two units of prayer – called “Rakaat”. A sermon follows, which asks Allah for forgiveness, mercy, and peace for every being across the world. EID Decoration The UAE goes to great lengths to decorate itself during Eid Al Fitr. Municipal areas, buildings, shops, roads and houses are decorated in lights and other cheerful adornments. 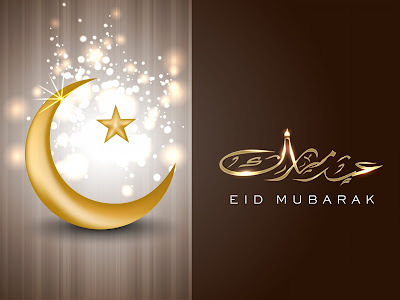 Eid Al Fitr for non-Muslims There are no special requirements for non-Muslims during Eid Al Fitr, although they are encouraged to greet others with “Eid Mubarak” and join the festivities. പള്ളികളില്‍ നിന്നും തക്‍ബീര്‍ ധ്വനികള്‍ ഉയര്‍ന്നുകൊണ്ടിരിക്കുന്നു. മാനുഷിക മൂല്യങ്ങള്‍ക്കും സാമൂഹ്യബന്ധങ്ങള്‍ക്കും വില കല്‍പ്പിക്കുന്ന ആഘോഷമാണ് ഈദുല്‍ ഫിത്വര്‍. സുഹൃത്തുക്കള്‍ പരസ്പരം വിളീച്ച് ഈദാശംസകള്‍ നേരുന്നു. ആശംസാസന്ദേശങ്ങളൂടെ പ്രാവാഹം കാരണം നെറ്റ്വര്‍ക്കുകള്‍ ജാം ആയിക്കൊണ്ടിരിക്കുന്നു.വീടുകളില്‍ സ്ത്രീകളും കുട്ടികളും മൈലാഞ്ചി അണിയുന്ന തിരക്കിലാണ്. തന്റെ വരുമാനത്തിന്റെ നിശ്ചിത ശതമാനം പാവപ്പെട്ടവന്റെ അവകാശമായി മനസ്സിലാക്കിക്കൊണ്ട് സക്കാത്ത് നല്‍കി ഒരു മുസ്ലിം തന്റെ ധനത്തേയും ഈ റംസാനിലൂടെ ശുദ്ധീകരിച്ചു. സകാത്തിന് പുറമെ ദാനധര്‍മ്മങ്ങളിലൂടെയും മനുഷ്യര്‍ തമ്മിലുള്ള ബാധ്യതകള്‍ നിറവേറ്റി. അതും കഴിഞ്ഞ് , പെരുന്നാള്‍ ദിനത്തില്‍ പട്ടിണി കിടക്കുന്ന ഒരാളും ഉണ്ടാകരുത് എന്ന മഹത്തായ ലക്ഷ്യത്തോടെ തന്റെ കുടുംബത്തിലെ വലുതും ചെറുതുമായ അംഗങ്ങളുടെ എണ്ണത്തിനനുസരിച്ച് ഫിത്വ്‌ര്‍ സകാത്തും നല്‍കുന്നു.പെരുന്നാള്‍ നമസ്കാരത്തിന് പള്ളിയിലേക്ക് നീങ്ങുന്നതിന് മുമ്പ് ഫിത്വ്‌ര്‍ സകാത്ത് പാവപ്പെട്ടവരുടെ വീട്ടിലെത്തിച്ച് ഇത് ഉറപ്പ് വരുത്തുന്നു. 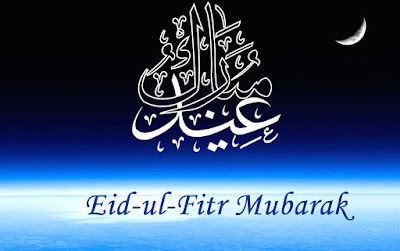 Eid Al-Fitr is celebrated on the first day of Shawwal, the 10th month of the Islamic lunar calendar. Traditionally, the observance begins with the sighting of the new moon. 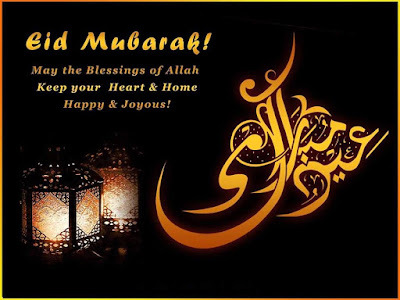 Eid al-Fitr عيد الفطر‎ ʻĪd al-Fiṭr ʕiːd al fitˤr is an important religious holiday celebrated by Muslims worldwide that marks the end of Ramadan, the Islamic holy month of fasting (sawm). 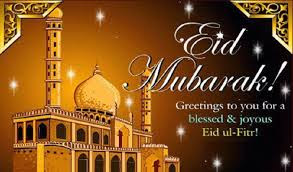 Eid Al Fitr is also called as Feast of Breaking the Fast, the Sugar Feast, Bayram (Bajram), the Sweet Festival and the Lesser Eid and festival of breaking of the fast. 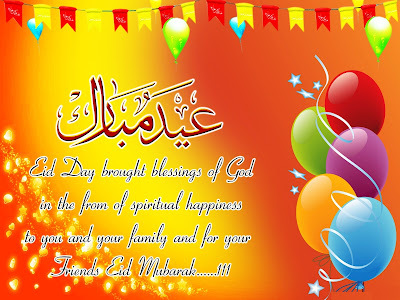 Eid Mubarak ঈদ মুবারক عيد مبارك‎ ید مُبارک, ईद मुबारक ഈദ്‌ മുബാറക്‌ is a traditional Muslim greeting reserved for use on the festivals of Eid ul-Adha and Eid ul-Fitr. As Ramadan's last days have arrived, Muslims across the globe gear up preparation for the biggest event of Eid al Fitr. The U.S. Post Office has issued a new Eid stamp to commemorate this year's holiday. 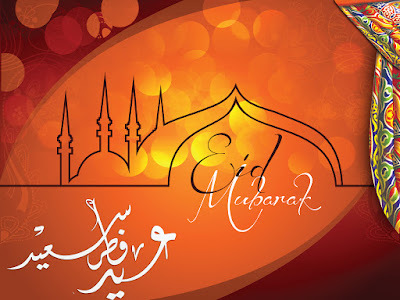 As you know that Eid is the most enjoyable day for all Muslim. All Muslim people celebrates this occasion. അല്ലാഹു ഏറ്റവും വലിയവൻ, അല്ലാഹു ഏറ്റവും വലിയവൻ, അല്ലാഹു ഏറ്റവും വലിയവൻ, ആരാധനയ്ക്കർഹൻ അല്ലാഹുവല്ലാതെ മറ്റാരുമില്ല, അല്ലാഹു ഏറ്റവും വലിയവൻ,അല്ലാഹു ഏറ്റവും വലിയവൻ,സർവ്വസ്തുതിയും അല്ലാഹുവിനാകുന്നു. ഈദ് നമസ്കാരം ഈദ് ഗാഹുകളിലും പള്ളികളിലും നടന്നു വരുന്നു. പെരുന്നാൾ ദിനത്തിലെ ഭക്ഷണ രീതികളും മറ്റ് ആഘോഷപരിപാടികളും പല രാജ്യങ്ങളിലും വ്യത്യസ്തമാണ്. ഇന്ത്യയിൽ സാധാരണയായി തയ്യാറാക്കപ്പെടുന്ന ഭക്ഷണം സുവിദമായ ബിരിയാണിയാണ്. Eid al-Fitr عيد الفطر‎ ʻĪd al-Fiṭr ʕiːd al fitˤr "festival of breaking of the fast", also called Feast of Breaking the Fast, the Sugar Feast, Bayram (Bajram), the Sweet Festival and the Lesser Eid, is an important religious holiday celebrated by Muslims worldwide that marks the end of Ramadan, the Islamic holy month of fasting (sawm). 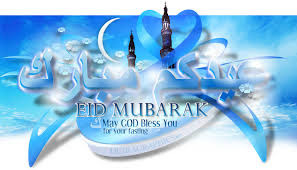 The religious Eid is a single day and Muslims are not permitted to fast that day. The holiday celebrates the conclusion of the 29 or 30 days of dawn-to-sunset fasting during the entire month of Ramadan. The day of Eid, therefore, falls on the first day of the month of Shawwal. This is a day when Muslims around the world show a common goal of unity. The date for the start of any lunar Hijri month varies based on the observation of new moon by local religious authorities, so the exact day of celebration varies by locality. However in most countries, it is generally celebrated on the same day as Saudi Arabia. 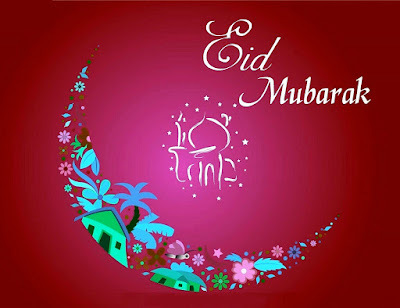 Eid Mubarak ঈদ মুবারক عيد مبارك‎ ید مُبارک, ईद मुबारक ഈദ്‌ മുബാറക്‌ is a traditional Muslim greeting reserved for use on the festivals of Eid ul-Adha and Eid ul-Fitr. 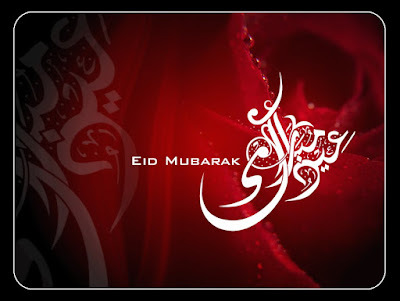 Eid refers to the occasion itself, and Mubarak means "Blessed." (e.g. : "Eid Mubarak, sister!") Muslims wish each other Eid Mubarak after performing the Eid prayer. The celebration continues until the end of the day for Eid ul-Fitr (or al-Fitr) and continues a further three days for Eid ul-Adha (or Al-Adha). 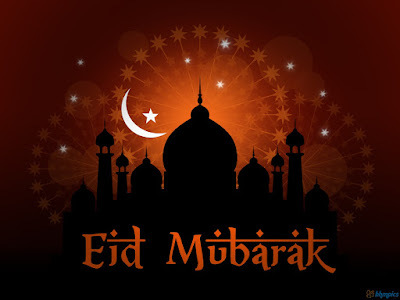 However, in the social sense people usually celebrate Eid ul-Fitr at the same time as Eid ul-Adha, visiting family and exchanging greetings such as "Eid Mubarak". This exchange of greetings is a cultural tradition and not part of any religious obligation. 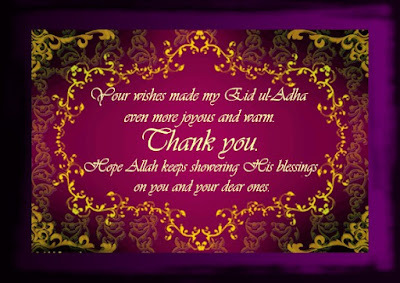 send u this msg but i m the 1st telling u and ur family Eid Mubarak. 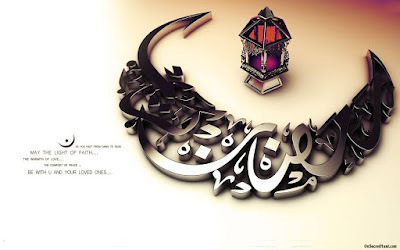 Eid Al-Fitr, Id al-Fitr or Eid ul-Fitr is a holiday marking the end of Ramadan, the month of fasting which is one of the greatest religious observance in Islam. 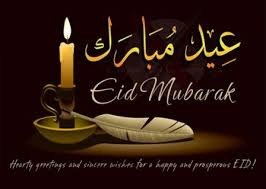 Eid also known as the “Festival of Fast Breaking” is a three-day affair, wherein Muslims all over the world celebrate the occasion by giving cards, gifts to their family and friends as well as by doing charitable works. 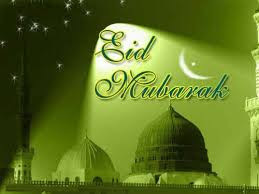 Muslims all over the world celebrate Eid with great pomp and show. 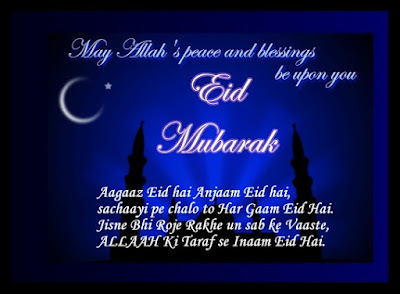 To Wish You **..*EID MUBARAK*. smile. miss you a lot. eid mubarak. Happiness like this EID DAY. 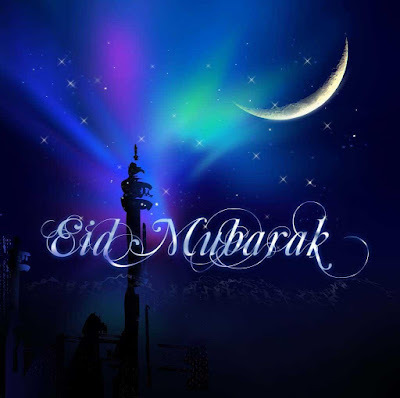 Wishing you EID MUBARAK. of Happiness like this EID DAY. Wishing you EID MUBARAK. 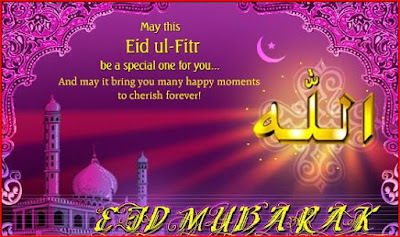 greeting you "Eid Mubarak ho"
your eyes and say you "EID Mubarak"
Eid Al-Fitr, Id al-Fitr or Eid ul-Fitr is a holiday marking the end of Ramadan, the month of fasting which is one of the greatest religious observance in Islam. 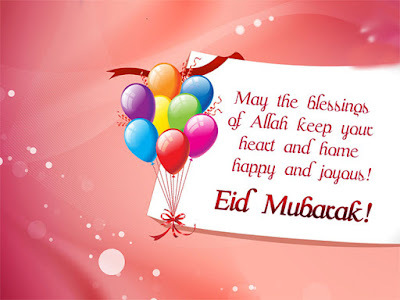 Eid also known as the “Festival of Fast Breaking” is a three-day affair, wherein Muslims all over the world celebrate the occasion by giving cards, gifts to their family and friends as well as by doing charitable works. 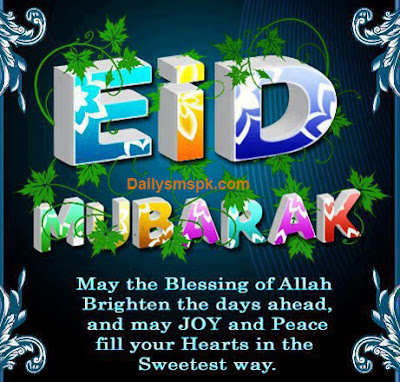 Muslims all over the world celebrate Eid with great pomp and show. They send greeting cards and gifts to their family friends and relatives. But nowadays we have a trend of sending Eid text messages. smile. miss you a lot. 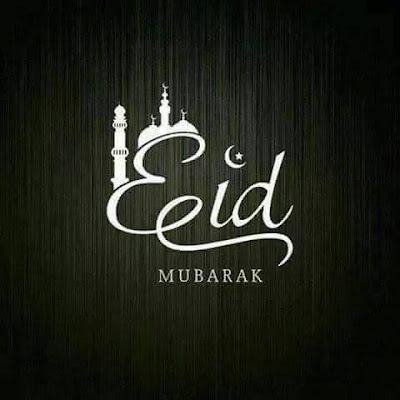 eid mubarik. Shehar Me ‘Bakar Mandi’ Lag Gae Hy.. 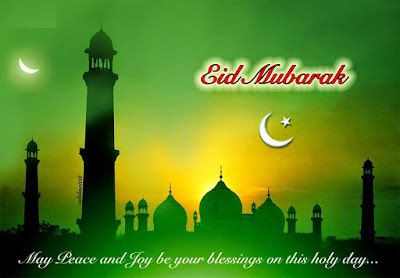 Happy Bakra Eid Season..
EID MUBARAK ho Aapko, Dher sari tarif aur khusiya mile aapko, But, Jab EIDI mile aapko to Please…. Aap Yaad karna Sirf Humko!! all businesses are not set up to run the same way. 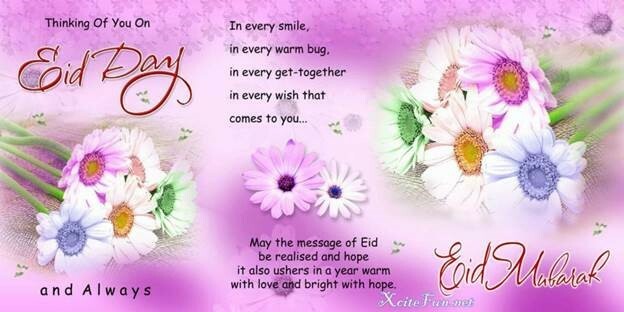 send u this msg but i m the 1st telling u and your family Eid Mubarak. Take note, Eid is celebrated twice a year, the first one is after the Ramadan, the occasion is called Eid Ul Fitr, and the other is celebrated during the month of Dhu al- Hijjah or two months after and the festivity is called Eid U Adha. Although the date of Eid al-Fitr is always the same in the Islamic calendar, the date in the Gregorian calendar falls approximately 11 days earlier each successive year, since the Islamic calendar is lunar and the Gregorian calendar is solar. Hence if the Eid falls in the first ten days of a Gregorian calendar year, there will be a second Eid in the last week of the same Gregorian calendar year. The Gregorian date may vary between countries depending on the local sight ability of the new moon. Some expatriate Muslim communities follow the dates as determined for their home country, while others follow the local dates of their country of residence. Amen I Wish You The Best Eid. 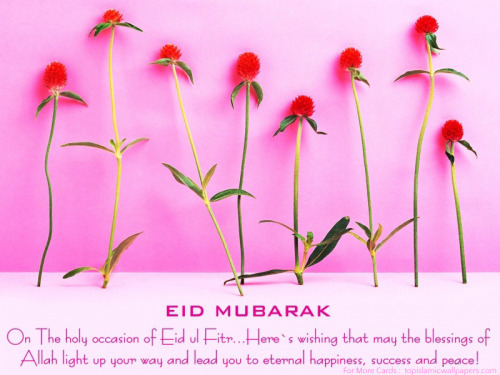 And Sisters Around The World, A Very Happy Eid. 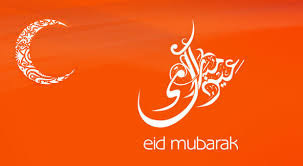 Warmest Wishes for Eid Mubarak To You and Your Family! What is the date for Eid Al-Fitr in 2015? 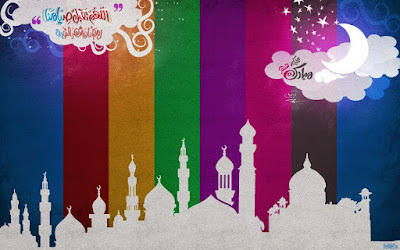 Eid Al-Fitr is expected to be on or around July 17th, 2015. But, the exact dates of Islamic holidays cannot be determined in advance, due to the nature of the Islamic lunar calendar. Estimates are based on expected visibility of the hilal (waxing crescent moon following a new moon) and may vary according to location. Eid al-Fitr, عيد الفطر‎ ʻĪd al-Fiṭr, IPA: [ʕiːd al fitˤr], "festival of breaking of the fast", also called Feast of Breaking the Fast, the Sugar Feast, Bayram (Bajram), the Sweet Festival and the Lesser Eid, is an important religious holiday celebrated by Muslims worldwide that marks the end of Ramadan, the Islamic holy month of fasting (sawm). 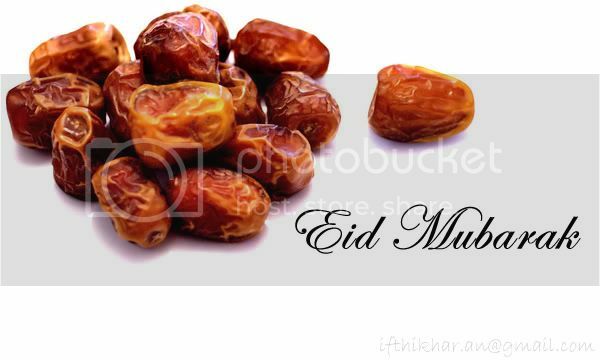 The religious Eid is a single day and Muslims are not permitted to fast that day. 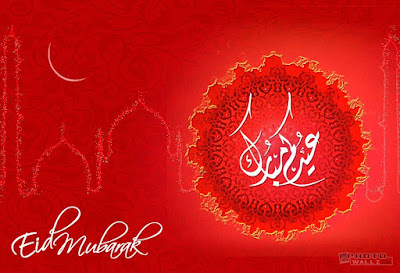 Eid holiday celebrates the conclusion of the 29 or 30 days of dawn-to-sunset fasting during the entire month of Ramadan. The day of Eid, therefore, falls on the first day of the month of Shawwal. Eid is a day when Muslims around the world try to show a common goal of unity. The date for the start of any lunar Hijri month varies based on the observation of new moon by local religious authorities, so the exact day of celebration varies by locality. However in most countries, it is generally celebrated on the same day as Saudi Arabia. Eid al-Fitr has a particular Salat (Islamic prayer) consisting of two Rakats (units) and generally offered in an open field or large hall. It may only be performed in congregation (Jama’at) and has an additional extra six Takbirs (raising of the hands to the ears while saying "Allāhu Akbar", literally "God is greater"), three of them in the beginning of the first raka'ah and three of them just before Ruku' in the second raka'ah in the Hanafi school of Sunni Islam. Other Sunni schools usually have twelve Takbirs, seven in the first, and five at the begining of the second raka'ah. This Eid al-Fitr salat is,depending on which juristic opinion is followed, Fard (obligatory), Mustahabb (strongly recommended, just short of obligatory) or mandoob (preferable). continue heir fast until the last day of Ramadan and pay the Zakat and fitra before offering the Eid prayers. 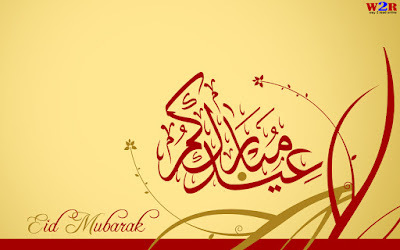 Eid al-Fitr marks the end of the fasting month of Ramadan. This has to do with the communal aspects of the fast, which expresses many of the basic values of the Muslim community; e.g., empathy for the poor, charity, worship, steadfastness, patience etc. Fasting is also believed by some scholars to extol fundamental distinctions, lauding the power of the spiritual realm, while acknowledging the subordination of the physical realm. Eid also teaches a Muslim to stay away from worldly desires and to focus entirely on the Lord and thank Him for his blessings. It is a rejuvenation of the religion and it creates a stronger bond between the Muslim and his Lord. 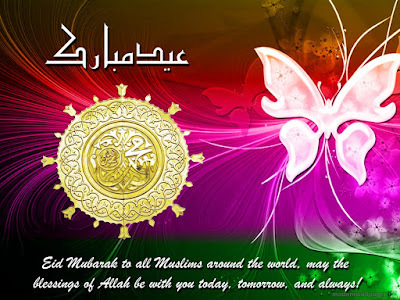 After the end of Ramadan, is a big celebration of Eid. I Pray That On This Occasion Of Eid, May Our Friendship Warmth Remains The Same. 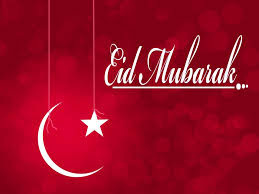 And As Allah Sprinkles The Creation May He Also Water You With His Wondrous Endless Blessings Today, Tomorrow And Every Day, Amen I Wish You The Best Eid. Before the advent of Islam in Arabia, there is mention of festivals as well as some others among the Arabs. The Israelites had festivals as well, but as is evident from the Old Testament and other scriptures, these festivals related more to commemorating certain days of their history. Eid ul adha is eid of sacrifice, and commitment to Allahs orders, May Allah bless us with the same in all circles of life, and help all amongst us, who are helpless,worried, and waiting for his rehmat, Ameen.Eid Mubarak. Wish you a Happy Eid and may this festival bring abundant joy and happiness in your life!May the good times and treasures of the present become the golden memories of tomorrow. 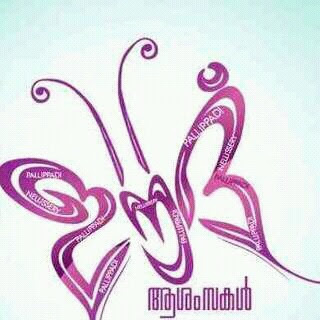 Wish you lots of love, joy and happiness. 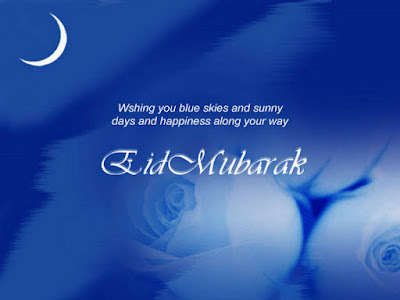 Many are the wishes that are being sent your way, but the is a special one for a very happy Eid Day. May this day bring peace and smoothness in your life, may it provide you the best time of your life. Happy Eid day May the blessings of Allah fill your life with happiness and open all the doors of success now and always. Eid Mubarak Those who believe and whose hearts are comforted by the mention of God, aye by the mention of God shall their hearts be comforted.. The koran the chapter of thunder palmer may the grace of Allah bring you bliss & happiness always Eid Mubarak! 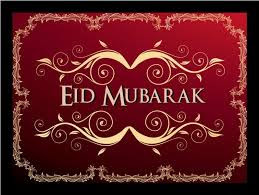 Eid Mubarak wishes are very common and often accompanied by hugging after the Salat al Eid in Bangladesh and neighboring countries. In the Philippines, it is recognized as a legal Holiday, though the greeting of Eid Mubarak is gaining ground only recently. In Turkey, where 'Eid Mubarak' is not common at all, the synonymous phrase "Bayramınız mübarek olsun" is used instead, along with its more Turkicized counterpart, "Bayramınız kutlu olsun", both meaning exactly the same: "May your holiday be blessed". Along with Turkish people, the Bosnian Muslims also commonly say "Bajram Šerif Mubarek Olsun", the response is "Allah Raziola". Another common Eid greeting by Bosnian Muslims is "Bajram Barečula". In Pashtun areas of Afghanistan and Pakistan, the Pashto Akhtar de nekmregha sha, meaning "may your festival be blessed" is common. Speakers of Arabic might also add "kul 'am wantum bikhair", which means "[May] you be well every year". In Indonesia, the most common expression is "Selamat Lebaran", Lebaran being an Indonesian name for Eid; whereas in Malaysia it is "Selamat Hari Raya Aidilfitri", Aidilfitri being the Malay transliteration for Eid ul-Fitr. 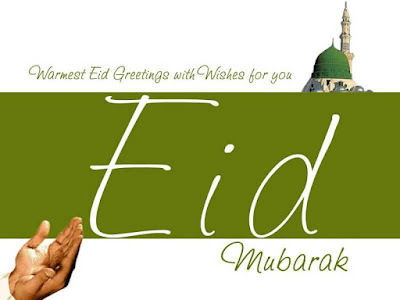 Throughout the Muslim world there are numerous other greetings for Eid ul-Adha and Eid ul-Fitr. The Companions of the Islamic prophet Muhammad used to say to each other when they met on Eid ul-Fitr: Taqabbalallâhu minnâ wa minkum (which means "[May] God accept from us and you [our fasts and deeds]").